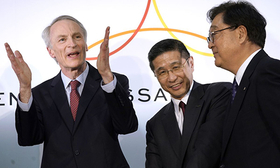 PARIS — Renault SA Chairman Jean-Dominique Senard said the alliance with Nissan Motor Co. and Mitsubishi Motors Corp. needs to be rebalanced "in spirit" to counter fears among the Japanese carmakers that he wants to dominate the decades-old partnership. "There was a lot of worry at the start, and I can understand that, about whether Jean-Dominique Senard was going to be dominant, would want to impose his views," the chairman of the French manufacturer said Monday in an interview on RTL radio. "There is no desire to dominate. We need a blank slate."